When Rabbi Yehuda Ben Yishai, the father of Ruti Fogel HY”D, walked onto the stage* I started sobbing. This great man had the face of…How can I describe it? He had the face of a man whose beloved daughter, son-in-law, and three grandchildren were murdered just four months ago. Many of you know that this was Ruti’s favorite quotation. It’s a reference to the Jewish people preparing itself for the coming of the Moshiach. And it has been repeated over and over since her death, at her funeral, and at the various memorial services. This quotation gives you a sense of my Rut, and the noble and supremely holy person she was. “I am very busy today, and have several meetings. Could we put this off?” I suggested. So the scribe came to my home and told me that that morning he had sat down to write the first word of the Torah scroll. And, as always, he had gathered together several people in desperate situations to participate in this auspicious event. And among those he had invited was a couple in dire need of Divine assistance. I thought that was unusual. How often does a page simply fall out of a siddur? In my hands, I have another photograph of my son-in-law, Rabbi Ehud. In this photograph as well, it is nighttime, and Rabbi Ehud is learning Torah at his yeshiva in Itamar. Again, the night is black, and the light from the Beit Midrash is so bright. It is blinding. 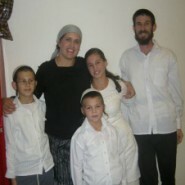 No matter how dark the night is, the light of the Torah, the light of this family will last forever. *I heard this story yesterday at the 13th Annual Binyan Shalem Conference, where Ruti Fogel HY”D had been a participant the year before. One Mother's Comment On "Won't be Getting to Shul Much or at All this Rosh Hashana?" So inspiring, their lives and their legacy. Let us continue to illuminate the world with Torah so their dream and ours will be realized with the coming of Moshiach. goosebumps ALL OVER…..tears in eyes…achy heart..big sigh. so beautiful, thank you for sharing, it really touched me, especially today with the tragic event in New York. Wow, amazing. I know I have been personally affected by this tragedy. There is not 1 Friday night that goes by I don’t think of this family…the grief and loss is being shared by all of Klal Yisroel…we are all crying with you.